Billed as, "Kalapiti, a tropical paradise hidden in the jungle," this villa encompassing two luxurious suites on an upper and lower level (respectively) is a small palace's more casual, tropical cousin. It's not hyperbole to say that this may be one of the most indulgent vacations of your life. You'll immediately become entranced by the skillful fusion of Moroccan and Mediterranean style. From ornate curves and colourful floor seating, to blue and white decor which echoes the tranquil water features at your disposal, you're sure to be swept away by both calm and decadence. Step into one of two gracious suites, or roam between both when you rent the entire villa. Suite El Sol Features a luxurious king size bed and two single beds, whilst Suite La Luna features 2 king size beds. How much thought was given to your comfort? For starters, you'll be sleeping on a 14 inch (35.5 cm) Simmons Beautyrest Black Luxury Collection mattress. Your bathroom is crafted of limestone and boasts jungle views. Your mornings and evenings can be spent taking in the view from your 66 foot (20 m) terrace, which overlooks the the property's botanical garden. Compare bathing experiences — slip into your suite's private Jacuzzi and later, steam away stress in Kalapiti's Turkish bath. Between the iPod docking station to flood the villa with the music of your choice, the 47 inch (14 m) flat-screen cable television with DVD player, and generous floor seating which double as reading nooks and lounge areas, there is plenty to do on nights indoors or rainy afternoons. 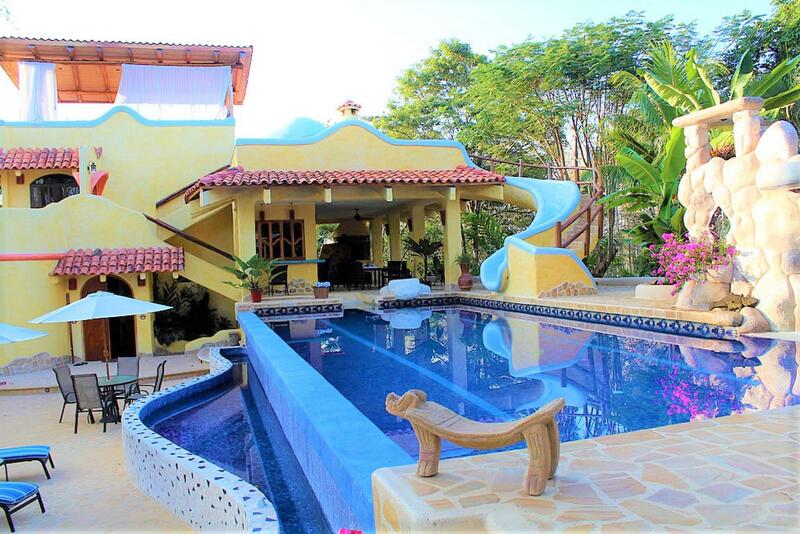 Outside, you can enjoy the property's botanical trail, solarium, sauna terrace, hot tub for six, and 49 foot (15 m) long swimming pool — with water slide and poolside bar! Enjoy garden fresh cuisine prepared and served at Kalapiti's on-site restaurant, or explore the nearby restaurants, cafés, and bars. Book a private yoga session or a massage, go on adventurous excursions and return to luxury, or simply enjoy a pleasant stay relaxing at a beautiful villa. Be the king or queen of Montezuma when you book your stay at Kalapiti Luxury Jungle Suites!